Read the Spotlight Team series on Aaron Hernandez that explains this text exchange. 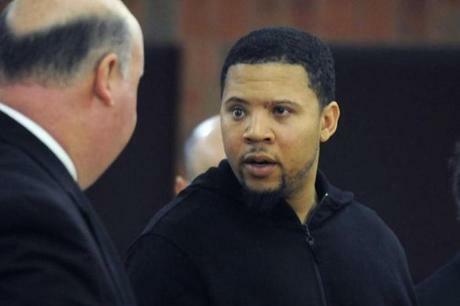 Aaron Hernandez exchanged thousands of text messages from March 28 to June 9, 2013, while he was concealing his role in the murders of two men in Boston’s South End and the attempted homicide of a friend, Alexander Bradley, who was with him during that double killing. The texts show just how much Hernandez was spinning out of control. 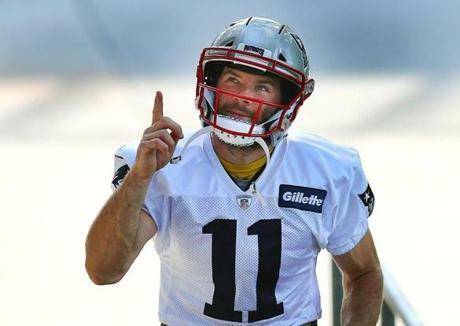 Fearful that he and his family were in danger, he had asked Patriots coach Bill Belichick just weeks earlier if he could be traded to a West Coast team, but that was rejected, according to his agent. Belichick asked a staffer to help Hernandez find a new place to live. Even as he confronts a vengeful nemesis in Bradley, Hernandez projects an upbeat attitude with teammates, friends and family. Hernandez needs surgery to repair a shoulder he injured in a game. The procedure, scheduled for the next day, will be performed by a surgeon who had operated on Patriots quarterback Tom Brady’s knee. 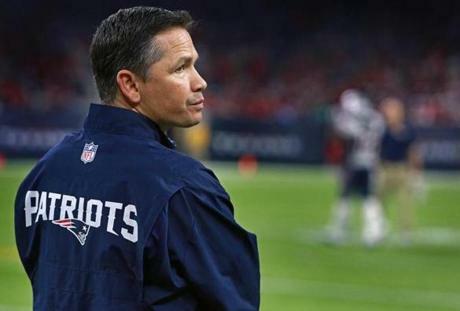 Brady’s personal trainer, Alex Guerrero, is managing Hernandez’s rehab. Je’relle Pierre, an ex-convict from Belle Glade, Fla., who was with Hernandez when Bradley was shot, tells Hernandez that he was hit by gunfire himself in an unrelated incident. Hernandez’s former Bristol Central teammate Brandon Beam consoles him about his surgery. Patriots strength coach Moses Cabrera inquires about Hernandez, post-surgery. Patriots offensive coordinator Josh McDaniels checks on Hernandez. He teases Hernandez about his fellow tight end, Rob Gronkowski. News has broken that Gronkowski has developed a post-surgical infection and may be sidelined to begin the coming season. Belichick has asked a Patriots staffer, Kevin Anderson, to help Hernandez find a new home because of Hernandez’s concerns about his family’s safety. Anderson believes he’s helping Hernandez find a home with higher security, potentially to replace his upscale North Attleborough home. Anderson believes Hernandez will at least want a house with a security gate. He’s mistaken. 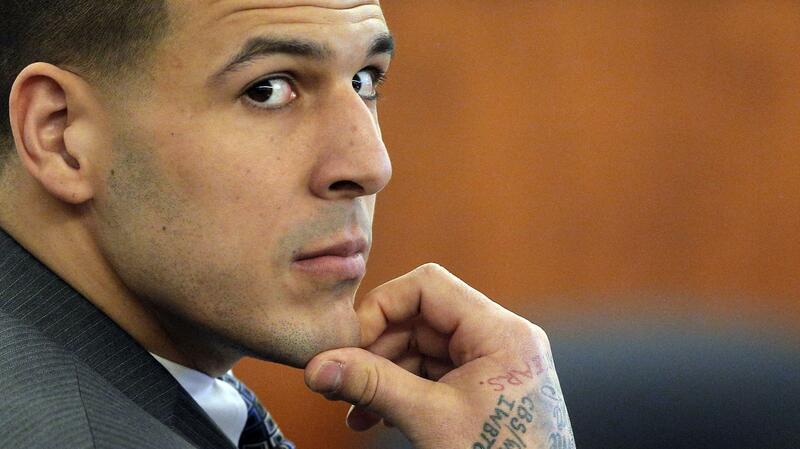 Hernandez doesn’t seem focused on security, and ends up with a nondescript apartment later known as his flophouse. The apartment in Franklin, Mass. 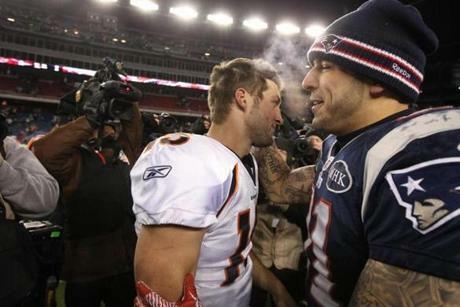 Tebow regrets that Hernandez has canceled plans to attend Tebow’s annual charity event in Florida. Hernandez apologizes and says he shouldn’t be flying after surgery. Hernandez’s financial adviser, Steve Vujevich, updates him on his account. 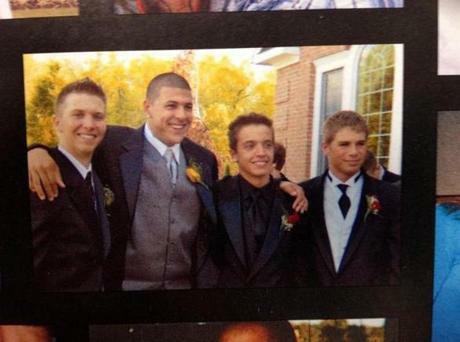 Hernandez developed a close friendship in middle school with Ryan McDonnell, and when they became adults Hernandez treated him more differently than most of his other Bristol friends. He shielded McDonnell from his criminal activity, his “thugging,’’ as Hernandez called it. He is very close to McDonnell’s family, especially his father, Tom McDonnell. Bradley wants revenge in the form of money — again. He prods Hernandez to get his lawyers involved in settlement negotiations. Peter Wininger, Hernandez’s basketball coach at Bristol Central High School, has since become the school’s principal. Ryan McDonnell is going from Connecticut to visit Hernandez in California. Ryan’s father expresses concern. Oscar Hernandez, the Belle Glade gun runner, is getting ready to ship the weapons north in a used Toyota that Hernandez paid for. Jenkins later acknowledged receiving the shipment but denied knowing there were guns involved. Hernandez offers to pay for a California vacation for Ryan McDonnell’s parents. Ryan’s father is grateful but suspects Hernandez is making the gesture to please Ryan and has told Hernandez he doesn’t want him to feel obligated. 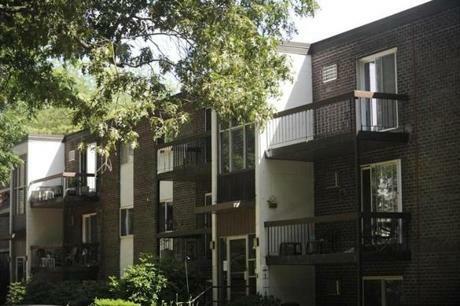 Hernandez needs to sign the lease for his Franklin apartment, which has no special security. His financial adviser, Vujevich, asks if he should send the paperwork to Hernandez’s fiancee, Shayanna Jenkins. It’s not unusual for wealthy athletes to field requests for financial help from people in their past. In this case, it’s DaQuan Brooks, who played high school basketball with Hernandez. 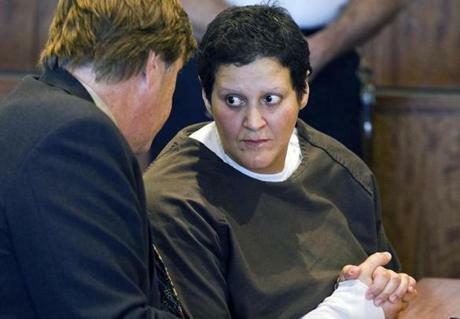 Hernandez’s cousin, Tanya Singleton, reminds him to call her son, Jano, whose father is Jeff Cummings. 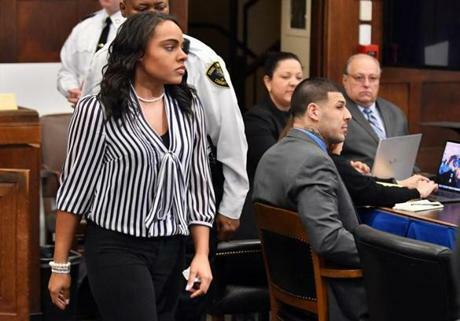 Aaron Hernandez has become a father figure to Jano after Cummings left Singleton for Aaron’s mother, Terri Hernandez. 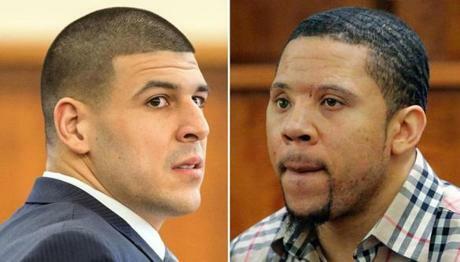 Patriots staffer Kevin Anderson was scheduled to meet Hernandez at the Franklin apartment. Hernandez was a no-show. Hernandez indicates Guerrero has given him some life advice. Hernandez tells Guerrero he’s too busy for rehab today because he’s dealing with his new house. ESPN reporter Field Yates texts Hernandez that he’s No. 77 on the NFL Network’s list of top 100 players. Hernandez reaches out for the first time in this batch of texts to Ernest (Bo) Wallace, an ex-convict from Bristol, Conn. Hernandez has hired Wallace as a paid assistant and bodyguard. They arrange for Wallace to pick him up at The Right Touch, a spa in North Attleborough. 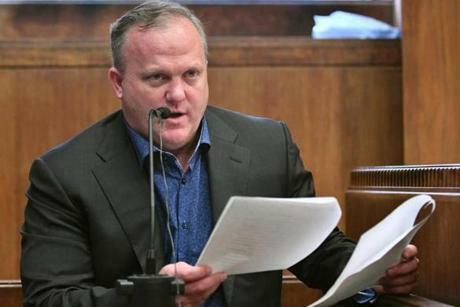 Hernandez complains to Vujevich, his financial adviser, about Jenkins contacting Vujevich about a landscaping project. Hernandez is not interested in the landscaping and is trying to tune out Jenkins. Jonathan Hernandez has been working as a graduate assistant on the University of Iowa’s football coaching staff. As it turns out, Hernandez will be standing trial for murder that day. Official training sessions have begun for the 2013 Patriots season. 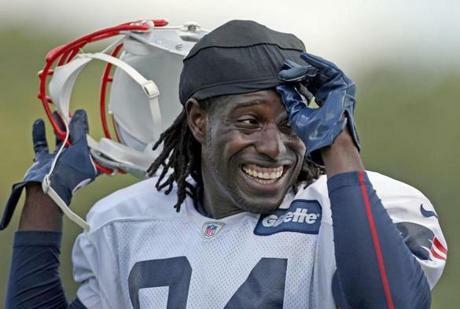 Hernandez’s former Patriots teammate Deion Branch is a free agent. He isn’t ready to retire. Branch, a wide receiver, jokes that he may become a defensive back and shut down Hernandez on defense. 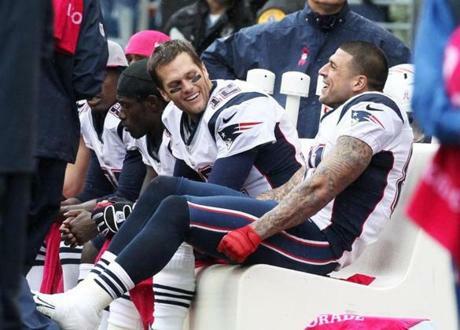 Hernandez plays along, telling him it will never happen. 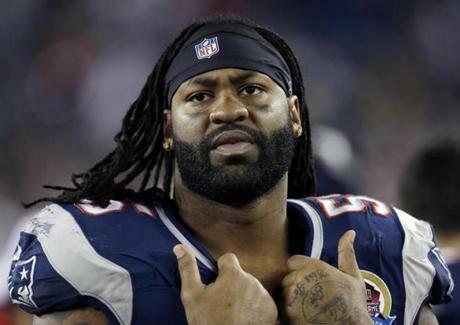 Branch, a former Super Bowl MVP for Patriots, never plays another NFL game. And, there is more drama at home. 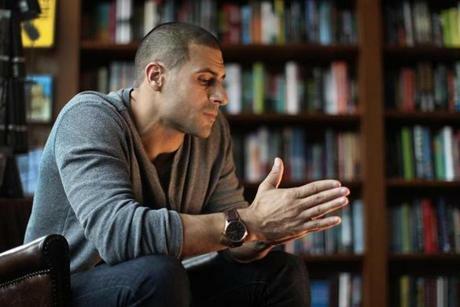 Hernandez is receiving Pop Warner’s annual Inspiration to Youth Award at a banquet in Boston. His agent’s assistant, Austin Lyman, spends much of the day coaching him on the brief speech he needs to deliver. Hernandez asks Lyman to have a car pick him up at his Franklin apartment. But he is clearly uninspired by the quality of the vehicle. By 1:30 in the afternoon, however, things have taken a turn. No texted reply by Hernandez. Bradley turns up the heat. 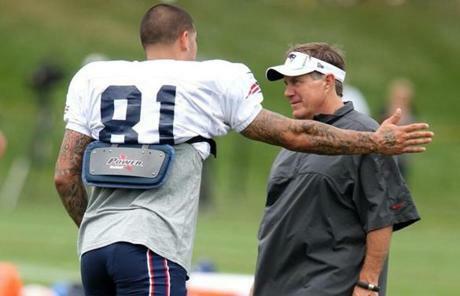 He tells Hernandez he will be near Gillette Stadium when Hernandez gets out of practice. Hernandez has his bodyguard Wallace poised. Hernandez then goes silent with Bradley, and Bradley continues texting in frustration. He finally proposes an amount he wants Hernandez to pay him. No texted reply by Hernandez. The episode ends without them meeting. No texted reply by Hernandez. He plans to meet with his lawyers about it. Hernandez was supposed to be at Gillette Stadium for treatment at 6:45 a.m. and arrived at 8:40 a.m.
Spikes points out that the practice was part of organized training activities, which are voluntary for players. Spikes himself has chosen not to attend. No texted reply from Hernandez. Hernandez also asks Guerrero for a recipe for a nutritional shake. This is the first reference in Hernandez’s texts to Odin Lloyd, his relatively new friend. 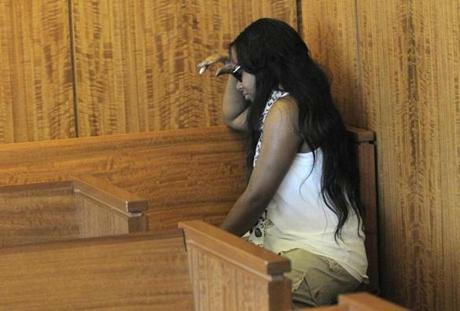 Lloyd is dating Shaneah Jenkins, the sister of Hernandez’s fiancee, Shayanna. Hernandez is otherwise occupied at the time. Wallace has driven him to the Prudential tower in Boston to meet with his agent, Brian Murphy, and his lawyers at Ropes & Gray about Bradley. Murphy once worked at the law firm. Murphy and Hernandez are having trouble connecting before the meeting. Hernandez texts Ryan McDonnell, the childhood friend he protects from his street life. Here he is playfully reaching out to McDonnell. The text conversation ends there. Hernandez — along with Wallace and Carlos Ortiz, two friends from Bristol — are involved in the murder of Odin Lloyd near his home in North Attleborough. Hernandez is arrested in the murder of Lloyd. Source: Spotlight obtained these texts through public records requests of court and law enforcement files. The texts were extracted from Hernandez’s Blackberry by the US Bureau of Tobacco, Firearms, and Explosives.